Medics Rugby Challenge - November 5th 2019 Get the date in your diary! Tuesday 8 November 2016 saw Brickfields play host to the 8th Medics Rugby Challenge. On an evening off less than pleasant weather conditions are great crowed poured through the gates to support the Royal Marines Charity at the home of Plymouth Albion. The evening’s proceedings began with a fiercely contested U16’s match between Devonport Services and Ivybridge Rugby Club. The young players showed excellent composure and skill, playing in front of an ever increasing and rowdy crowd to produce a fantastic contest. The difference at the end of the match was merely a try as Devonport emerged victors at 10 points to 3. Following the game all attention turned to the Grand Stand where the Royal Marines band played to boost anticipation further. Then it was time for the big one. The sides from the Royal Marines and the Peninsular Medical School made their way onto the pitch. Before battle commenced there was time for a few introductions. Guest of honour Thinus Delport was introduced to both sets of players. This was swiftly followed by a rendition of the last post and a respectful moment of silence for those we’ve lost and those the Royal Marines Charity so deservedly helps. Then it was in to the game. It became apparent very early, given the conditions, that it was going to be a game of tug and war between two well matched teams. The majority of the early game was played in the middle third of the pitch with handling errors and scrums dominating early proceedings. Fifteen minutes in the marines got the first score of the game. The medics straying offside allowed fly half Richard Cadywould to stroke home 3 points. The following 20 minutes was much more of the same. Indiscipline and poor handling costing both sides scoring opportunities. The Medics appeared to have found a way back into the game late in the half as their scrum half, Owen Mitchell, converted a penalty to make the score 3 – 3. The Medic’s looked to have secure themselves a level scoreline going into the break, but it want to be. Some excellent handling and brute strength from the Marines saw Ben Cox go under the posts. The try was duly converted by Cadywould and the Marines took a 10 – 3 lead into the break. Unfortunately for the Medics, the Marines took control in the second half. Strong tackling and powerful ball carrying saw them assert themselves on the match. The Medics withstood the pressure being piled on from the Marines for 20 minutes, including holding the ball up in goal to prevent a try, but then the constant drilling away at their defence took its toll. The last twenty minutes became somewhat one sided affair, and though the medics continued to lay their bodies on the line in defence, the fitness, power and strength of this very well disciplined Marines side became too much to handle. At the 60 minute mark, Marines winger Semi Tabanvesi made the score 15 – 3 with an excellent run from the half way line, his pace seeing off the defence. Shortly after, with 15 minutes left to play, Marines captain Ryan Morris found himself in some space around 20 meters out and made no mistake as he put his head down and ran for the line, holding off the desperate Medics defence he crossed for the 3rd try of the match to make it 20 – 3. In the dying embers of the game, it looked as if the Medics may have one last hurrah, pushing deep into Marines territory with some good handling and strong ball carrying. However it wasn’t to be, the ball was knocked loose in the tackle and several Marines players kicked the ball through and up to the Medics try line, where Cadywould gathered and went over for the 4th and final try of the evening. Moments later the final whistle blew, leaving the final score 25 -3. The score line may tell a different tale, but in truth this was a very tight and exciting game of rugby. For sixty minutes it was all out warfare on the pitch, a true dog fight between two very talented and capable teams. The Medics held their own against a team that plays far more rugby than themselves and made it a wonderful spectacle. All in all it was a truly fantastic evening raising money for a wonderful cause. Here’s to next year's game on 7 November 2017 – and hopefully some better weather. We're still collecting the funds in so we'll let you know the final figure shortly! Tickets from Doc Lambert at saddadz@live.co.uk or Kit World - buy a shirt and get a free ticket. Corporate Entertainment is available at Plymouth Albion before the rugby from 16:30. 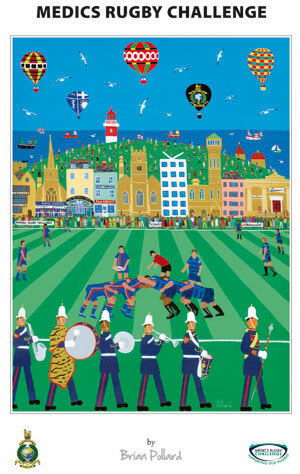 £20 per person includes welcome drink, food choice, entry ticket and souvenir programme. Please state choice and indicate if vegetarian at time of booking. 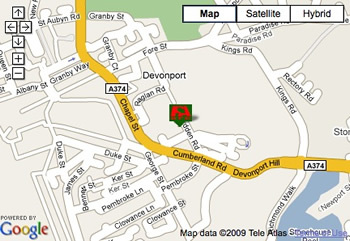 8 Russell Ave, Plymouth, PL3 5RA.